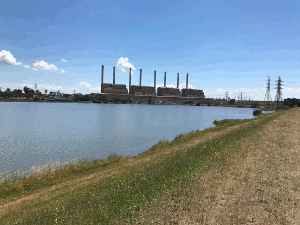 The State Government's Target One Million plan committed to stocking barramundi into Hazelwood Pondage in the Latrobe Valley. Thousands were stocked, grew very well, and the fishery opened to anglers in December 2016. Some fantastic fishing was enjoyed by local and visiting anglers. Barra of 85cm were caught. 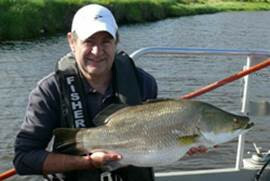 Almost one in four anglers caught a barramundi at Hazelwood. An independent study showed the fishery had contributed around $700,000 to the local economy. From 9.00 am on 1 February 2018, recreational anglers chasing barramundi at Hazelwood Pondage will have better shore-based access to catch that fish of a lifetime. 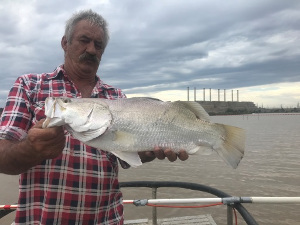 Victorian Fisheries Authority have worked with Gippsland Water to open a 500m stretch of land alongside the pondage channel where lots of stocked barramundi now reside. The new access makes the barramundi accessible to anglers who would otherwise have to travel to Queensland or the Northern Territory to tackle with this iconic sportfish. The access improvements include a road, fencing, signs and a new car park, all of which will keep Hazelwood Pondage a family friendly option that can be enjoyed by locals and visitors. Intensive monitoring of the fishery between April 2017 and January 2018 has found that around 1,500 barra had survived the cold winter, some of which are now approaching the magical-metre-mark. To ensure the fishery provides year-round angling opportunities for people of all ages, the VFA will continue to stock rainbow trout in winter, grown at our Snobs Creek hatchery. The stocking of other species such as Australian bass fingerlings will also be considered. For more information about the fishery, including its rules, stocking history and access, plus other frequently asked questions, see the frequently asked questions.